Eamonn Taaffe (left) landed he winning point for Tubber in the junior B hurling final. HE spent just 17 minutes on the field in Croke Park on September 3, 1995 and only once hit the ball. Yet that seismic Eamon Taaffe goal, four minutes from time, still resonates in Clare. 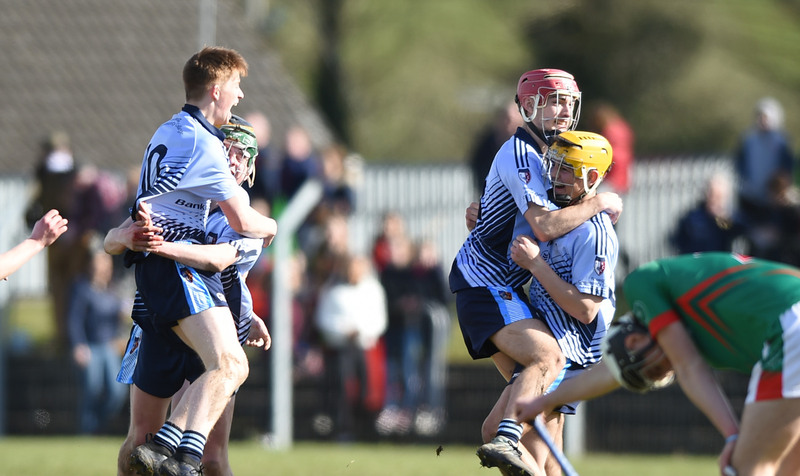 It was the moment that propelled the county to a first All-Ireland win since 1914, bridging an 81-year gap. The Tubber man was one of that 1995 panel present for Clare County Council’s 20th anniversary civic reception in council headquarters on Monday night. 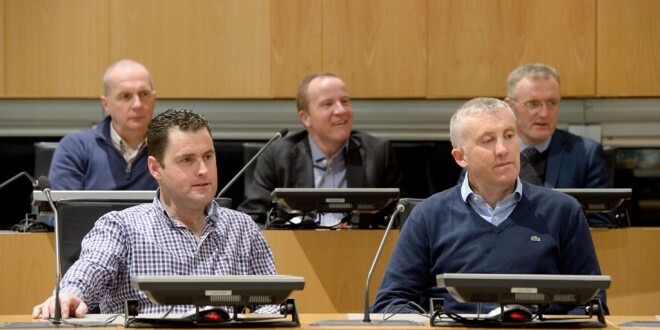 He looks fit and fresh, which indicates why he’s the only one of that panel still playing competitive hurling. “Go handy,” he urged when asked if he had yet reached 41 or thereabouts. “I’m only 40, although I’m not far from 41. I’ll be 41 in February,” Taaffe confirmed. Twenty years after that extraordinary afternoon, which altered the history of Clare hurling forever, Taaffe remembers everything. Loughnane stuck to his word and with the game seemingly getting away from Clare, Taaffe got the call. “He gave me the shout and said ‘there’s a lot of loose ball in around the goal. Try to latch on to one’. When it happened, I went blank. The hair stood on the back of my head,” he said of that goal. He was the man who eclipsed Offaly goalkeeper David Hughes but Taaffe feels others had earned the moment more than he had. “When it comes up or when you see it on telly, the shiver goes through you. It was a special day. “There were probably a lot more fellas who deserved to be in that position more than I did. I hadn’t too much hurling done that year. I had a lot of injuries and there were other fellas on the bench who had an awful lot more than me done. It was a bit of luck, I suppose, that I was picked to go in and another bit of luck that the ball came back off the post to me,” Taffe said, insisting that no, Cyril Lyons was not in the square. “Not all all,” he maintained. Seconds after burying the most famous goal in the history of Clare hurling, Taaffe was back on the bench. A moment before the goal, he feels, did him in. If he can, Taaffe will pull on the Tubber jersey in 2016. He will keep going for as long as the body allows. “Now and again my back starts at me but I’d love to keep going. If I can at all, I’m going to try. Let it be a bit of junior or whatever, it’s nice to be able to tog out and try and do your bit,” the Tubber farmer surmised, adding that talk of the glory days never becomes tedious. 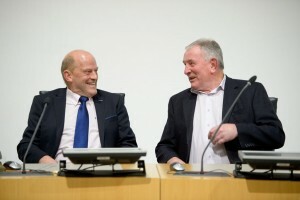 Earlier in the evening, Ger Loughnane spoke to the council on behalf of his players. Two decades older but still his men. “Every time Ger stands up, you’d hear a pin drop. There’s something about him. He’s able to make his presence felt and it was the same back when we were playing. Every time Ger spoke inside in the dressing room, you would hear that pin drop and if he asked you to go out through the wall, you were going to have a go at it,” Taaffe said. His former team-mate Liam Doyle clearly recalls when Clare’s march to eventual All-Ireland success started. Had they only conquered Munster, it would have sated most of the players, though not the management. These days, Doyle is gladly amongst women, which is reflected in his coaching involvement in his home club, Bodyke. “Back a couple of years ago, I was over the local hurling team but it’s all women in my house now. I’m gone to the other side of the fence. I’m involved with the camogie club. We’re joined with Tulla for the last four or five years. We wouldn’t have a team on our own. You’d like to see the girls involved in whatever sport it is, out in the fresh air,” he said, referring to his daughters Shauna (13), Lauren (9) and Sinéad (4). The players meet at least once a year and Doyle never tires of it. “Frank (Lohan) organises the weekend away. Most of us go and either play golf or stay over. That bond is going to remain forever more,” the double All-Star wing-back predicted. As for Loughnane, Doyle says he’ll never lose his touch. “You could throw him out there with a crowd of pigeons and they’d listen,” he said, beckoning towards the dark December night.